“WATERMELON BOY” BECOMES AN INTERNET SENSATION - What About Watermelon? There are people who eat watermelon, and then there are people who eat watermelon like a boss. Mitchell Schibeci — aka “Watermelon Boy” — is one of those bosses. 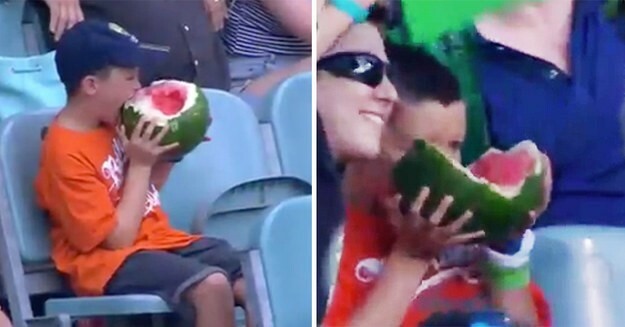 The 10-year-old boy was spotted chowing down on a watermelon, rind and all, during a televised cricket match in Australia on January 2 and the rest is viral video history. The game’s commentators gave him some screen time (check out the video below) with some commentary about his eating habits and the hashtag #WatermelonBoy started trending throughout Australia and soon spread worldwide. Mitchell said he had been eating watermelon rind since the age of two. He’s the son of Australian sports radio host Tony Schibeci, who’s Twitter feed has been blowing up with updates about his suddenly famous son. “Oh Boy. My son is the new family Cult Hero,” tweeted the elder Schibeci after realizing what a stir his son had created. A hero, indeed. Smart, too. There are a lot of nutrients in watermelon rinds, and young Mitchell is an inspiration to watermelon lovers everywhere.